I don’t know how people who are not stress-eaters cope with their stress. When faced with a seemingly insurmountable challenge, I can think of nothing that offers more solace than food – and the more indulgent, the better. So it was that after an epically trying day not long ago, I found myself scouring the cupboards for a snack that might improve things. I was aiming for something chocolatey and sweet, but filling – so I wouldn’t have to think about eating again for a while. Mindful of my nursing baby, I was also hoping for something that wasn’t completely devoid of nutritional value. I settled on baking some gluten-free brownies from my new favourite cookbook. While I was waiting and waiting and waiting for them to bake (my one complaint about the gluten-free baked goods is that they require a little more patience than their wheaty sisters), and to atone in advance for the overindulgence that was imminent, I made some granola. This is the granola that I have been eating since I was a child, and it never fails to transport me to a kinder and gentler time. This is basically a template. I don’t think even my mom, whose recipe it is, ever makes it exactly according to these specifications, so go with whatever is in the cupboard that suits your taste. Combine first nine ingredients in a very large bowl, and mix well. In a large glass measuring cup or similar jug, whisk together water, oil, and vanilla. 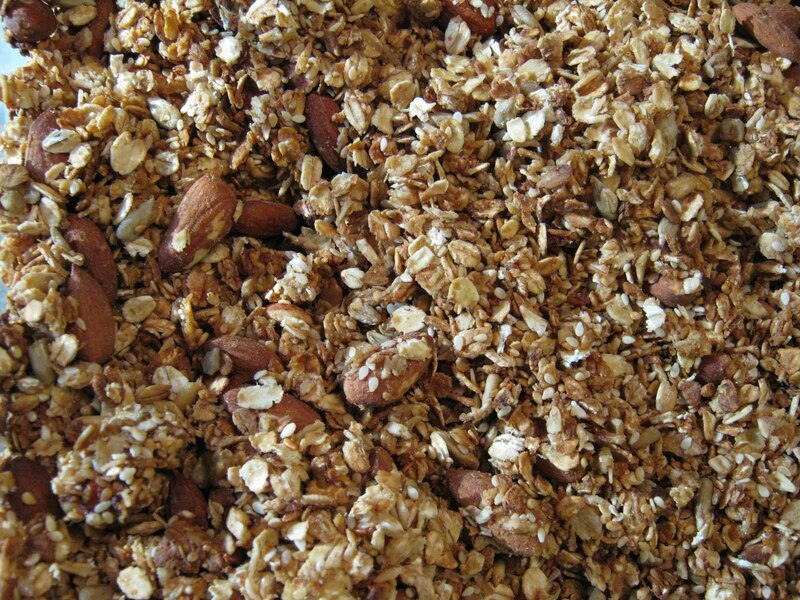 Pour liquid ingredients into oatmeal mixture and mix well – I use my hands for this part, but a wooden spoon would work too. Divide evenly between two large rimmed baking sheets and bake 30-40 minutes, stirring granola about halfway through cooking time. Cool completely in pans before transferring to an airtight container.